In his book Adults in the Room, Yanis Varoufakis gives us his version of the events that led to the Tsipras government’s shameful capitulation in July 2015. In the fourth part of a series of articles analyzing the book, Eric Toussaint traces how Varoufakis selected advisors more sympathetic to the financial establishment than the Syriza program. See Parts One, Two, and Three of Eric Toussaint's analysis of the revelations contained in Yanis Varoufakis's recent memoir, Adults in the Room. First published by CADTM. Translated by Snake Arbusto and Christine Pagnoulle. If you haven’t yet read Adults in the Room by Yanis Varoufakis, order it from your bookseller. 1 It has all the ingredients of a political thriller — suspense, plot twists and turns, betrayals, and more. But what is interesting about the book is that it gives the author’s version of events that have influenced and are still having repercussions on the international situation — in particular in Europe, but also beyond, because the disappointment caused by the capitulation of Greece’s radical-Left government has left its mark on everyone’s mind. The main purpose of our critique of the policies implemented by Greece’s government in 2015 is not to determine the respective responsibilities of Tsipras or Varoufakis as individuals. What is fundamental is to conduct an analysis of the politico-economic orientation that was put into practice in order to determine the causes of its failure, to see what could have been attempted in its place and to draw conclusions as to what a government of the radical Left can do in a country in the periphery of the Eurozone. 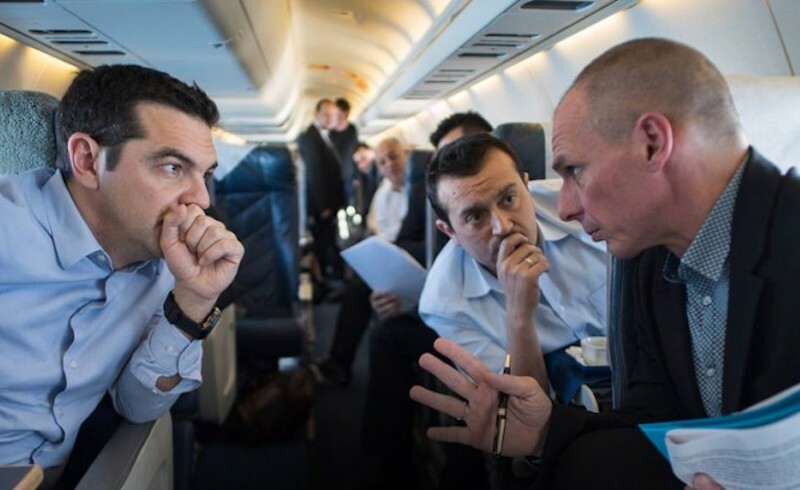 In this part, we will discuss the advisers Yanis Varoufakis brought in to make up his team. It must be acknowledged that, from the time he selected his principal advisers, Varoufakis called on people who were not at all disposed to see to it that Syriza’s promises were kept (and that is an understatement) and to implement alternative policies in order to free Greece from the grip of the Troika. Varoufakis writes: “While Alekos remained an opponent of Syriza, he was personally supportive and promised to come up with a name. The same night he texted me the name of Dimitris Mardas.” 2 Varoufakis contacted Mardas directly and offered him the position of Alternate Minister of Finance. Varoufakis explains that the second choice he had to make involved who would be president of the Council of Economic Advisers. He realised that the position had been filled on his behalf by the vice-Prime Minister, Dragasakis. The latter had chosen George Chouliarakis, an economist around thirty years old who had taught at the University of Manchester before being seconded to the Central Bank of Greece. Chouliarakis played a damaging role from the start of Varoufakis’s tenure, and yet Varoufakis kept him in place to the end. His name will come up several times in the narrative of events. Then Varoufakis added Elena Panaritis to his team, because she was familiar with the language and modus operandi of the Troika. Panaritis, as a PASOK MP, had voted in favour of the first Memorandum of Understanding in 2010. Before that, she had worked in Washington, mostly at the World Bank — where, Varoufakis tells us, she built up an excellent network of connections with the Washington-based institutions. That included former US Treasury secretary Larry Summers, whom she introduced to Varoufakis. Panaritis, in the 1990s, worked for the World Bank in Peru, where she collaborated with the corrupt and dictatorial neoliberal regime of Alberto Fujimori. As Varoufakis tells it, “When I met her again a few days before the election I did not hesitate for a moment to ask her to join my team, for there is no better person to fight the devil than one who has served him and, through that experience, become his sworn enemy.” 4 Later events would show that not only had she not become his sworn enemy, she continued to collaborate with him. Varoufakis prefers to talk about the foreign personalities who are directly connected to the establishment: “Besides Norman [Lamont], my overseas supporters included Columbia University economist Jeff Sachs, who played a central role as adviser and advocate, the aforementioned Thomas Mayer of Deutsche Bank fame, Larry Summers and Jamie Galbraith[…].” 13 In other words, with the exception of Galbraith, exactly the type of personalities alliances should not have been made with if a solution favourable to the people of Greece was to be promoted. Here are a few examples. In 1998, with Alan Greenspan, Executive Director of the Federal Reserve Bank, and Robert Rubin, Summers had also succeeded in convincing the Commodity Futures Trading Commission (CFTC) to remove all controls on the Over-the-Counter (OTC) derivatives market. The door was then wide open for the acceleration of the banking and financial deregulation that led to the crisis in 2007-2008 in the US, which had repercussions in Greece in 2009-2010. We should add that in 2000, as Secretary of the Treasury, Summers pressured the president of the World Bank, James Wolfensohn, to remove Joseph Stiglitz, who had succeeded him as chief economist and who was highly critical of the neoliberal policies Summers and Rubin were putting into practice all over the planet, wherever financial fires were breaking out. After the arrival of the Republican president George W. Bush he continued his career, becoming president of Harvard University in 2001. But put himself in a particularly uncomfortable position in February 2005 when he provoked the ire of the academic community following a discussion at the National Bureau of Economic Research (NBER). 18 Questioned about the reasons why few women hold high positions in science and engineering, he said that women intrinsically have a lower aptitude for sciences than men, ruling out social and family origin and discrimination as possible explanations. The result was a huge controversy, both within and outside the university. 19 Summers apologised, but pressure from a majority of professors and students of Harvard forced him to resign in 2006. Sagias was not a politician but, as he introduced himself half-jokingly, a systemic lawyer.…There was hardly a large-scale business deal involving private interests and the public sector that Sagias and his successful practice had not been involved in: privatizations, large-scale construction projects, mergers, all were within his ambit. He had even provided legal counsel to Cosco, the Chinese conglomerate that had acquired part of the port of Piraeus and was eager to take over the whole of it, a privatization that Syriza vehemently opposed. 2. Yanis Varoufakis, Adults in the Room, Chapter 5. 4. Varoufakis, op.cit., Chapter 5. 7. Lazard is a worldwide financial counselling and asset-management firm. Created as a French-American house in 1848, Lazard is now listed on the New York Stock Exchange and is present in 43 cities in 27 countries. One of its directors who is well known in France is Matthieu Pigasse. Under his leadership the bank has advised several governments in the areas of debt and asset management (read privatisations): Ecuador in 2008-2009 foe debt, Greece in 2012 and 2015, and Venezuela in 2012-2013. Pigasse has direct interests in the Paris daily Le Monde, the Huffington Post, and the magazine Les Inrockuptibles. See https://en.wikipedia.org/wiki/Matthieu_Pigasse. In late 2017, Matthieu Pigasse and Lazard allied with the corrupt and repressive regime of Congo’s president Denis Sassou-Nguesso to provide aid in its dealing with creditors: https://www.challenges.fr/economie/quand-la-banque-lazard-dirigee-par-mathieu-pigasse-rejoint-dominique-strauss-kahn-et-stephane-fouks-au-chevet-du-congo_558075 (in French). 8. A specialist in sovereign debt, Daniel Cohen is an adviser to Lazard, in which capacity he advised Greece’s Prime Minister George Papandreou and Ecuador’s president Rafael Correa in renegotiating their countries’ debt. He participated with the World Bank in the Heavily Indebted Poor Country (HIPC) Initiative. He is an editorialist for the daily Le Monde. Cohen has also been an adviser to François Fillon, who was Prime Minister under Nicolas Sarkozy from 2010 to 2012. He then threw his support to François Hollande, president of France from 2012 to 2017. 9. Varoufakis, op.cit., Chapter 5. 12. Daniel Munevar is a post-Keynesian economist originally from Bogotá, Colombia. Between March and July of 2015, he worked as Yanis Varoufakis’s assistant while the latter was Finance Minister, advising him on budget policy and debt sustainability. Before that, he was an adviser to Colombia’s Ministry of Finance. In 2009-2010, he was a CADTM staff member in Belgium, then, after returning to Latin America, he co-ordinated the CADTM network in Latin America from 2011 to 2014. He is an important figure in the study of public debt in Latin America. He has published a number of articles and studies. He participated with Éric Toussaint, Pierre Gottiniaux and Antonio Sanabria in compiling World Debt Figures 2015 (http://www.cadtm.org/World-Debt-Figures-2015 ). Since 2017 he had worked for the UNCTAD in Geneva. Daniel Munevar refers to his participation in Varoufakis’s team in “Why I’ve Changed My Mind About Grexit,” CADTM, 24 July 2015, http://www.cadtm.org/Why-I-ve-Changed-My-Mind-About. In the book mentioned earlier, James Galbraith stresses the importance of the assistance he received from Daniel Munevar. 13. Varoufakis, op.cit., Chapter 5. 16. Lawrence Summers, interview with Kirsten Garrett on the occasion of the annual assembly of the World Bank and IMF in Bangkok in 1991, “Background Briefing,” Australian Broadcasting Company, second programme. 17. The law adopted under the leadership of Robert Rubin and Lawrence Summers is known as the Gramm-Leach-Bliley Act Financial Services Modernization Act of 1999. This law was adopted by the US Congress, dominated by a Republican majority, and promulgated by the Clinton administration on 12 November 1999. It allows commercial banks and investment banks to merge and establish universal banking services, that is, those of a retail bank, an investment bank and an insurance company. The adoption of this law came after an intensive lobbying campaign by banks to allow the merger of Citibank and the insurance firm Travelers Group to form the conglomerate Citigroup, one of the world’s largest financial services groups. The new law in essence abrogated the Glass Steagall Act or Banking Act, in place since 1933, which declared that the professions of commercial banking and investment banking are incompatible and avoided major banking crises in the USA until the one that broke out in 2007-2008. 18. Financial Times, 26-27 February 2005. 25. I will return to the subject of the role Varoufakis himself played in pursuing the privatisation of the port of Piraeus and his relations with Cosco.